There is something about roasted garlic that makes me swoon. The anticipation of waiting for it to cook up in the oven is almost too much. I’m the one poking at it every ten minutes, impatiently waiting for it to reach that perfect golden color and becomes buttery soft. This bread? A killer way to use some roasted garlic. 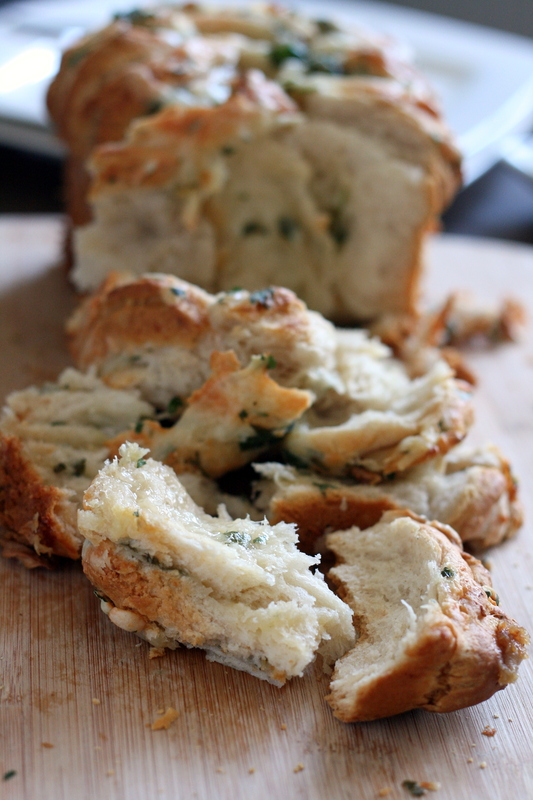 It’s like garlic bread x 1000 and super simple to throw together. 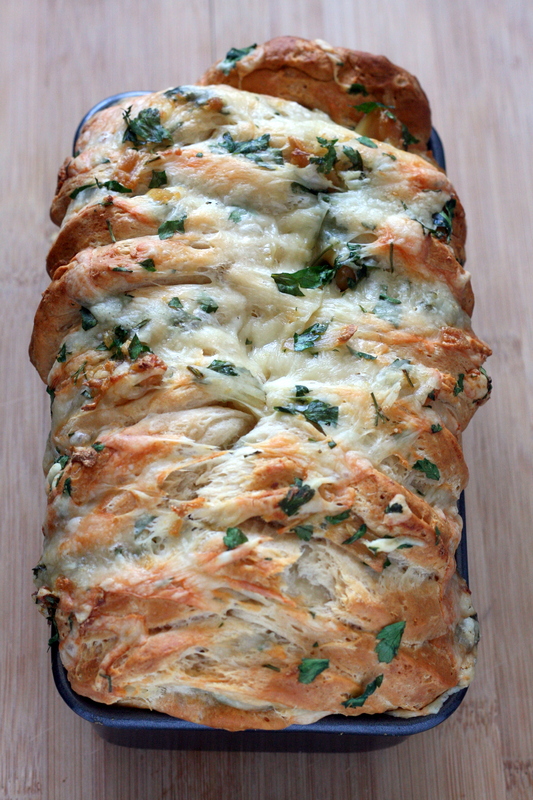 Easy, breezy, beautiful… garlic bread. A big thank you to Nicole over at Seven 8 Nine for hosting this month’s ‘baking with garlic’ theme! Love garlic? Want more? 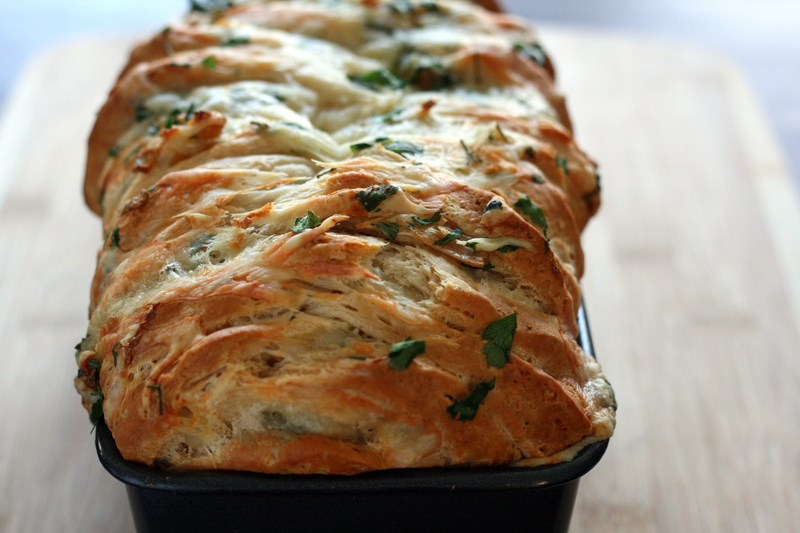 Make sure to check out her blog for a roundup of all the delicious garlicy recipes! Roast the garlic: Preheat oven to 400°F. Peel most of the paper off the garlic. Cut about ¼-inch off the top of the garlic bulbs to expose the tips of the cloves. Drizzle each head with 1 teaspoon of olive oil and wrap in foil. Place garlic in preheated oven and bake for 35 – 40 minutes, or until golden brown and soft. Unwrap garlic and set aside to cool. Reduce oven temperature to 350 °F. Lightly grease a 9×5 loaf pan and set aside. Once garlic is cool enough to handle, gently squeeze the base of the bulb to release the cloves of garlic. Place cheese, garlic, and parsley in a bowl and mix until well combined. Bake in preheated oven for 45 minutes or until golden brown. Serve warm. Categories: Bread, Muffins & Rolls, Food, Quick & Easy | Tags: bread, quick and easy | Permalink. This looks so yummy and very easy! Have you tried using a different kind of cheese? Oh my gosh, that looks divine! I WISH it was gluten-free.. perhaps I can try with GF buns!